Our view: A good way to introduce your children to the theater is through your local community theater. For younger children, community theaters often put on children's productions for young children to attend. Since community theater is usually less expensive than professional productions, you won't be wasting as much money if your child does not make it through the entire show. Besides, often this shows are quite interactive and young children really enjoy them. For older children, community theater often provides an opportunity for them to participate. Either they can try-out for a show or they can help out backstage or building sets or in some other capacity. Many a professional actor has started out his or her career in community theater. Of course, not all community theater is equal. There are some really bad community theater productions, and there are some excellent ones. Unfortunately, there is no way of knowing in advance which of these categories a show is going to fit into. However, we would recommend giving it a chance because if you don't go because you are afraid it will be bad, you will miss out on some great shows. One ways to find out about your local theater community theater and the productions they put on are to check the your local paper for notices of auditions or advertising that a show is going to be put on. Another way is to look on-line if a community theater does not have its own web-sites, you may be able to find listings for local community theaters on your towns web-sites. In an case, we would definitely recommend getting involved with community theater in some way either by going to see shows, or by being in shows, or by working on shows. Me - Today I am recommending Gravity Guy. It is a really fun game. All you have to do is keep tapping the screen and he goes up and down. You have to keep him from falling. However, it is not as easy as it sounds. Each level gets faster and faster and faster. I would definitely recommend it. Mom - Today I am recommending Jeopardy. If you like the show, Jeopardy you will like the app Jeopardy. It is slightly easier than the TV show because the answers are multiple choice. However, it is not that much easier. You have to think fast because if you don't you will run out of time. Our whole family usually all plays as a team against the computer. It is a lot of fun. Me - Things we like to do at the beach, wow! I like to swim in the ocean with my Mom's college roommate and friend. She is super nice and fun. My brother and sister and I all love her. Sometimes, I used to like to play that I was a mermaid. I like to walk along the beach and collect shells. When I was younger, I would collect any shells even the broken ones. Now, I only collect special shells. Special shells are ones that I don't already have a million of. It is hard to find many of those. I try to build a sandcastle but I am not very good at it. They always collapse. I put down one bucketful of sand and when I try to put another on top it all falls apart. I like to eat at restaurants on the boardwalk. We have this one restaurant we usually go to. We used to go to a different one, but they tore it down and build condos. We almost always get ice cream when we are walking on the boardwalk. The beach is fun, you should go to the beach. Mom - Fun on the beach is a lot different for me now then it was when I was a kid. When I was a little kid, I liked to play in or near the water most of the time. Nowaways, I hardly go in the water at all. When I was a teenager, I was only interested in lying out on the beach and trying to get a tan. Now that I know how bad the sun is for you, I am not interested in getting a tan at all. I still like lying out on the beach sometimes, but I don't do it to get a tan. I just like to lie on the beach and read a book or talk to my husband and/or kids or any friends that we go with. I like walking along the shore. I also like walking along the boardwalk. We usually get ice cream along the boardwalk. We used to eat along the boardwalk too, but we found we liked the restaurants near the boardwalk better than the restaurants actually on the boardwalk. We have this one particular restaurant in Pt. Pleasant that we usually go to. It is called the Shrimp Box. I also like to look in the little stores along the boardwalk. We rarely if ever buy anything there, but it is fun to look. We don't go to the beach that often, and I wouldn't say I am a person who is crazy about the beach. However, I still have fun when we go there. And that's our view. What do you like to do at the beach? When I was little we used to go out of state to visit my grandfather a lot. My Dad told my grandfather to get me a Dora the Explorer couch that converted into a bed for me to sleep on when I was down there. When we got down there, my grandfather had gotten a Bob the Builder couch instead. When we told him that it was Bob the Builder and not Dora the Explorer, he said "What's the difference? They're all the same." So my Dad said "One is a boy, and the other is a girl." Once when Aurella was little, she was telling a story about a woman named Daddy. Me - Finn and Rachel/Cory and Lea, devastating! I am so depressed that Cory Monteith died. I found out from my Mom, who pretty much tells me everything. I was so devastated. I couldn't believe it. That was like the last thing I ever could have thought would happen. Cory and Lea Michele were so cute together. I feel terrible for her. Glee will never be the same without Finn and Rachel. They were even voted one of the top couples in TV history according to TV Guide. We knew that without TV Guide telling us that. My Mom and I thought they were the cutest couple in the history of TV. I hope that Ryan Murpy handles Cory's death by killing off his character of Finn and having all the Glee club mourn his passing. I also hope that they mention that prior to his death he and Rachel had somehow gotten back together. I don't care how he dies as long as there is no more Finn. I don't want them to deal with it by saying something like he moved away. I think that if they handle it properly ratings for the first new episode of Glee will skyrocket. After that, they will plummet because nobody is going to like the show anymore. So many people were leaving. Too many new people that Ryan Murphy was trying to replace the old people with came. There can't be a Glee without Finn and especially without Finn and Rachel. It was great when Finn and Rachel weren't together but you knew they were in love because they were always looking at each other lovingly. It was perfect when they were actually together. Then Rachel went off to NYADA and lived in New York. They couldn't look at each other, but you knew that they still loved each other especially when Santana found out Brody was a gigolo and Finn beat him up and said "Stay away from my future wife!" That was my favorite part of the whole season. Now, that he is gone none of that can happen. They can't look at each other. They can't mention the fact that they love each other. They can't get back together. Glee will never be the same. Everyone seems so sad about Cory Monteith's passing. Everyone has commented about how sorry they are that he has died. My Mom and I wonder why Ryan Murphy hasn't said anything yet. We are curious to see what he thinks and what he will say and do. I realize that Corey's death puts him in a bind because they were almost ready to start shooting for the season, and now they have to do a bunch of rewrites. However, he could have at least taken a few minutes to say he wa saddened by Corey's passing or something. Every time, I think about Corey Monteith, I am either going to feel like crying or cry. Whenever I watch old episodes of Glee, it makes me sad especially when I see Finn and Rachel together, or looking at each other, or thinking about each other, or talking about each other. Whenever I listen to the music, I want to cry too especially Don't Stop Believing or Without You. Don't Stop Believing for me, represents the whole show. It was the first real full song they ever sang on the show as a group. It was the first song they sang in both concerts. Also, they sang it in Journey to Regionals, the last episode of the first season and also the best episode ever. Just hearing the lyrics makes me want to cry. Without You if you really listen to the words like "I am lost. I am vain. I will never be the same without you. ", describes Finn and Rachel and Cory and Lea's relationship especially now that he is gone. One of the hardest things to deal with is that, now, I cannot even watch my favorite show without being sad and wanting to cry. The one good thing that came out of this is that I learned a life lesson. I learned that you are never too young to die, and you should live life while you can and always take risks. Never be too afraid to try anything no matter how scary it my seem because you won't have forever. Even though I know, me and my Mom are really sad, I can't even imagine how sad Lea Michele must feel. They really did seem to be in love. Me and My Mom thought that Lea Michele had been pregnant in real life. It is sort of good and sort of bad that she wasn't. If she was, she would have a piece of Cory with her forever. However, then she would have to raise the baby without him by her side and maybe that would make her sadder. I hope that by the end of Glee, Rachel isn't with a new person because it wouldn't be the same. In real life, I do hope that Lea finds love and is happy again, but for me it will never be the same as when she was with Cory Monteith. Cory Monteith may not be alive anymore but he will live on forever in the hearts of me, my Mom, the cast and crew of Glee and all the other fans of Glee. Mom - Glee used to be my favorite show. To me, Finn and Rachel and the relationship between them was always the heart of Glee. Even when the characters were not together on the show, I just loved the way they always looked at each other. It seemed so real and maybe it was because as we all know later Cory Monteith and Lea Michele, the actors who played Finn and Rachel, fell in love in real life and dated. It was bad enough last year that a lot of the original Glee kids were graduated and were hardly on the show anymore. However, when Finn and Rachel broke up and weren't even in the same place for most of the season and couldn't even give each other those longing looks, the show just wasn't the same for me, and I stopped watching it for most of the season. Late in the season, it looked like Finn and Rachel might be heading for a an eventual reunion so I started watching it again. Even though the season ended and Finn and Rachel still weren't back together, things seemed so hopeful. Now, with the death of Cory Monteith that can never happen. I feel really bad about that and about the fact that no matter how long Glee continues after this, for me, it can never be the same. I feel sad that Cory is gone. I feel bad for anyone who was a part of his life in any way: his family, his friend, his fellow cast mates and the crew of Glee even the fans. Even though Cory admitted that he had drug problems in the past and had recently served a stint in rehab, you never heard anybody say anything bad about him. I feel the worst for Lea Michele. She and Cory were just so cute together. My girls and I were so excited when they got together in real life. It was comforting when they were together in real life even when they weren't together on the show. We were hoping that in real life at least, if not on the show, they would get married and have babies together. Of course, now that we will never happen in real life or on the show. Still when I picture Rachel without Finn or Lea without Cory, it makes me feel really really sad. And that's our view. Which celebrity's passing affected you the most and why? Me - Today I am recommending True Jackson, VP. It is a good show. It is about a girl who is only a teenager but works in a major fashion company. It funny and good. I really like the characters especially True and Lulu. Ryan is really stupid and funny. Jimmy and True always like each other. Eventually, they date and they are really a cute couple. Any teenager who is into fashion will love this show. Mom - Today I am recommending, America's Secret Slang. If you are interested in language and where words and phrases come from, this is the show for you. It is particularly fun to find out where phrases that don't seem to make any sense come from like "talking turkey," "pushing the envelope" and "how do you like them apples?" There have been six episodes of the show on the history channel so far, and I, for one, hope there will be more because it is a really fascinating show. Me - Swimming, wow! I love swimming. I love diving. I love water slides. I love just swimming around and being wet. I hate being wet and wrinkly in the shower. I love being wet in the pool. Of course, when I get out of the pool and I am all wrinkly I don't like that so much. I recently learned to dive at my friend's house. She has a diving board. I usually just jump off it. I learned to dive off the side of the pool. Now, I am trying to learn to dive off the diving board. I just love the pool! Sometimes, when my Grandma is in the hot tub at her pool, she lets me put my arms and or legs in. After putting my legs and arms in the hot tub, when I put them back in the pool they feel freezing. One time when I went to the pool, I was there with my cousin. He had really long hair and bangs. He was over by the hot tub. There was an older man in the hot tub. I thought that my cousin was the man's granddaughter. I didn't realize until he got closer that it was my cousin. I love going to the pool. Mom - I like swimming. I used to like it better when I was a kid but I like it. I hate the process of getting ready to go to the pool putting on my bathing suit and taking off my jewelry and putting on sun screen and stuff. Where we live, we have to walk to the pool. It is not so far, but we usually go on really hot hot days so it feels much further than it really is. I hate coming back from the pool all wet and having to change again and when my hair is really wet and gets all tangled if I don't dry it or at least brush it really well. When I am actually in the pool, I usually do more standing around, floating around and stuff like that than actually swimming. I try to do more actual swimming now though because I am trying to get more exercise. Sometimes, it is hard though because when you don't have a private pool, public pools can be really crowded. We would never have a pool. My husband used to have a pool, and he hated it. It was a pain to take care of and hardly anybody ever swam. Anyway, there is too much liability involved with owning a pool if somebody gets hurt or something even if they weren't supposed to be in the pool in the first place. When I was a kid, my father taught me how to dive. I haven't really done it in years though. I don't go swimming at all as much as I did then either. And that's our view. What is your favorite thing to do in the pool? When my brother was little he said "When Grandpa doesn't want his van anymore, can we have it?" My Dad said. "Boy, you want everything. You want his house, you want his van. Do you want his clothes too?" "Well, not the big ones." my brother replied. When my stepson was little he said "Daddy and I are going to build you a house in Maryland." I said. "I don't want to live in Maryland." "Where do you want to live?" he asked. "Maybe a little closer to Grandma and Grandpa ." I said. "Okay." he said "When they move out we'll move in." Chase as their bat dog. That is one of the special things about the Thunder. Not too long ago, Chase retired. For the game that he retired, everyone was allowed to bring their dog. I thought we should have dressed up one of our cats and put her on a leash and brought her. A few days later, my Mom read on-line that he had passed away. I was sad, and I felt bad for his son, Derby. When I was about 7 and Aurella was about 3, I was a fan of the day at a Thunder game. I was in a really bad mood and I was cranky because I was supposed to go to my friend's house. Then, when we got to the baseball game, they picked me to be fan of the day. Mom, Aurella and I got to go on the field. Aurella and I got to have our picture taken with Chase and Derby. Also, we got to pet them. I even have a Chase stuffed animal. He is a brown dog with a bat in his mouth and a bandana around his neck that says Chase. I have had him for a long time now. The bat fell out of his mouth and the bandana came off his neck. Chase will always hold a special place in my heart. Mom - We love our Trenton Thunder, a minor league baseball team, an affliate of the New York Yankees. Since the 2002 baseball season one of the things that has made the Thunder unique is their bat dog, Chase. Chase would retrieve the bats after a Trenton player batted. He did not work every at bat or even every game. He usually appeared in the first inning of games. Seeing him was always one of the pleasures of going to a Thunder game. In later years, he was joined by his son, Derby. A few years ago, Melia was the fan of the day. Melia and her sister, Aurella and I got to go on the field before the game. Melia and Aurella got to pet Chase and Derby and have their picture taken with them. On July 5, 2013, Chase retired on his 13th birthday. We were lucky enough to be at that game. This time Aurella was even picked as the fan of the game. We did get to go on the field again, but this time the girls didn't get to pet the dogs. There were actually four dogs on the field at the game: Chase, Derby, and two of Chase's grandchildren. There were dogs in the stands as well as it was a bark in the park game where people were free to bring their dogs. I never knew there were so many dogs that could be so well behaved for so long. A few days later, Chase died. There are still two bat dogs in the minor leagues. Derby has taken over for Chase, and Derby's brother, Ollie, is the bat dog for the New Hampshire Fisher Cats. Our family will still enjoy going to the Thunder and seeing Derby, but we will miss seeing Chase. Our view: Sleepovers at the Blueclaws are for Scouts and/or members of the Blueclaws kids club and their families. The good news is that membership in the Blueclaws kids club is free. The sleepover, however, is not. It is a little less expensive than the previous sleepover we experienced at the Camden Riversharks. However, it also did not offer as much as the sleepover at the Riversharks. There were no meal or snacks included. There was no baseball clinic offered the next day. There was just a game ticket, fireworks after the game, a movie (not a current movie but one that is already out on DVD), and the opportunity to sleep in a tent (of your own) on the field. All for about $20.00 each for adults and $17.50 for kids. It is a fun experience especially if you have never gotten to sleepover at a baseball stadium before, but if you have to choose between a sleepover at the Riversharks and one at the Blueclaws, the Riversharks give you a lot more for only about 10 or so difference in price. And that's our view. Tune in tomorrow for another Talking Topics. Me - Today I am recommending 40-Escape. You have to find a way to unlock the door. For example, on level 11 you have to spell out eleven. It is really fun and challenging. Mom - Today I am recommending Disney Movie Rewards. At Disney Movie Rewards you can get reward points for buying Disney movies and CDs and for going to Disney movies. You can trade in your points for rewards, such as, movies, memorabilia, and other things even Disney experiences.If you love Disney, this is definitely the reward program for you. For more information or to join go to disneymovierewards.com. Spoiler Alert: If you have not seen Despicable Me 2 and you intend to, do not read any further. Me -Despicable Me 2, wow! It was so hilarious! It was one of my favorite movies. Totally awesome! I loved Despicable Me 2. I love them both equally. My favorite character is Agnes. She is so cute and funny. I like the way Gru turned good in the first movie, and now he is such a loving father. I like the ending of the movie. I love when Gru and Lucy got married. It made them all even more of a family. I like the girls too except Edith's character is not developed as much as the other two. I like that Gru is right all of the time about El Macho even though at first it is because he is mad that El Nacho's son likes Margo. I like how he ends up using the taser lipstick that Lucy gave him. Despicable Me 2 was a really good movie. Mom - Originally we had no intention of seeing Despicable Me. We decided to see it because we saw the preview, and we liked the three girls especially the youngest, Agnes, who reminded us a little of an older Boo from Monsters Inc. When we saw the original movie, we almost didn't make it through the whole movie because in the middle of the movie both my girls got upset by something that happened in the movie and wanted to leave. We convinced them to stay and when things ended up working out happily in the end, they decided they loved the movie. We couldn't wait to see Despicable Me 2. We were not disappointed. I really like the way Gru and the girls really gel as a family in this movie. The character of Lucy fits right in and gives the girls the only thing that Gru could not give them by himself - a mother. Agnes is as cute as ever. Margo is really growing up. Only Edith is not a full developed character. All that we know about her is that she a bit of tomboy, she doesn't like kissing, and she never takes off her hat. I love the minions. They are so cute and funny. All in all, there is a lot to like about this movie. And that's our view. What movie would you love to see a sequel to? NOW PLAYING EVERY WEEKEND IN NYC! Adapted from the classic children's book series by Stan and Jan Berenstain, The Berenstain Bears LIVE! brings everyone's favorite bear family to life in a thrilling theatrical experience that kids as well as their parents will treasure for many years to come. As always, Bear Country is not without its complications: Brother Bear's grades are slipping, Sister Bear still has a few things to learn about making new friends, and Papa Bear just can't stop eating junk food. Thankfully, we can always depend on Mama Bear and her loving patience to help set things right. 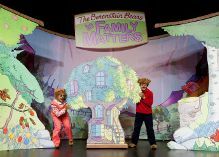 Now in its 3rd smash year, The Berenstain Bears LIVE! will give boys and girls of all ages the chance to fall in love with these characters, just as their parents did when they were growing up. Our family loves the New Jersey Devils hockey team. When my brother was little he thought the whole team lived together. He asked my Mom "Where do Martin (Martin Brodeur is the Devils goalie) and his friends live? When my stepson was little he thought I knew everything. Once he asked me "What do Martin (Brodeur) and his friends (his teammates) eat for dinner? Tune in tomorrow for a Saturday Special and tune in on Monday for another Talking Topic. Me - Trenton Titans, wow! I am so sad that the Trenton Titans are no more. I always would look forward to going to Titan games during the winter. We even knew someone who worked for the Titans. I am not sure what her job title was, but her name was Megan. She once even got us free tickets to a game. This past season, we went to a lot of games. At one game, I even caught a puck and at another my Dad caught a t-shirt during the t-shirt toss. The Titans didn't have very many giveaways. Their special game day events didn't always happen or if they did they weren't good. They had a petting zoo with only one or two live animals. However, the games were good and fun to watch. I especially loved the last game which turned out to be the last game ever. It was the best game I ever saw. It was the perfect ending to the season and the Titans. I really miss the Trenton Titans, but they will live on in my heart forever. Mom - This was a sad week in our household. We found out our Trenton Titans are no more. The Trenton Titans were a minor league hockey team. They started out as the Trenton Titans, and they were affiliated with the Philadelphia Flyers. For a while, they were the Trenton Devils and they were affiliated with the New Jersey Devils. Then, for their last season, they became the Titans again. We loved them no matter what they called themselves. My stepson even had a birthday party there. We didn't go to that many games in a season and there were some seasons we didn't make it to any games at all. Ironically, we actually made it to the most games we ever went to in a season this past season. I am really going to miss the Titans. Baseball and hockey are my favorite sports. There are a bunch of minor and independent league baseball teams nearby. If we lost one, it would be sad, but there would still be another. The Titans were the only minor league hockey team anywhere near us. We love the New Jersey Devils. However, since they moved to Newark, we don't go to games anymore. There is not enough parking, and we don't like the current ownership who seem to care only about those who can afford season tickets. We don't like any other local NHL team. Besides, the NHL tickets are a lot more expensive then minor league hockey tickets. It is going to be a long winter without the Titans. I miss them already. And that's our view. What sports team would you really miss if it went away? Our view: Miniature golf used to be mostly about getting the ball around and through cute little buildings and bridges and things. Some miniature golf courses were particularly pretty. There was one in particular in Florida with a carousel and castles and things. Nowadays, times have changed. There may still be miniature golf courses like that but they are not all that way. Hole-in-One Golf Course has no cute little buildings at all. It is literally like a small golf course. Instead of cute little buildings, there are waterfalls, streams, and ponds. For these reasons, I would recommend it more for older children and/or children who are particularly interested in golf. The course is open all year round from 10:00 to dusk. There are no lights so it is not open after dark. There is also a 9-hole par 3 executive golf course at the same location. However, for that no equipment is not provided and there is a minimum age of 5. For more information go to hole-in-onegolfcenter.com. Me - Today I am recommending Wreck It Ralph. It was a good movie. It is funny. It is about a video game character who doesn't want to be a bad guy any more. It is unique story and very enjoyable to watch. Mom - Today I am recommending Flipped. It is a sweet little coming of age movies that was out last year. Prior to seeing the movie based on the commericial, I thought it was going to be one of those movies where the teenage boy helpless swooned over the girl of his dreams. Instead it turned out to be the other way around. Juli Baker is the one in love with Bryce Loski from the moment she seems him. Bryce, however, wants nothing to do with her. The story of their relationship and how it evolves is really touching. Me - Get Smart, wow! My Dad got the whole series Get Smart on DVD, and we have all been watching it. I love it. It is really funny. My favorite character is 99. My sister likes Fang the dog. We haven't gotten to the episodes where Max and 99 fall in love and get married yet. I am waiting for that. 99 is already in love with Max, and he likes her a little bit unless someone else pretty is there. He seems to like her unless there is another pretty girl. All the girls in the show always seem to be blondes except for 99 who is a brunette. Max is funny and oblivious and stupid. I like the chief. I liked Sigfried. My favorite episode that I have seen so far was when 99 had to have dinner with a guy from KAOS and everytime they were going to kiss Max banged a gong because he was jealous. I like the theme song. It is always stuck in my head. If you ever see Get Smart on DVD in store, you should get it. Kids or adults would both like it. Mom - When Get Smart was originally on, I was a baby. Later, I saw a few episodes here and there in syndication. My husband, however, was a big fan of the show. He got the entire series on DVD, and we have all been watching it. It is a really funny show. I love the crazy situations that Max ends up in and I love all the clever gadgets he uses. Some of it was really ahead of its time. I mean we will don't have shoe phones (at least not that I know of) but in those days phones were not portable at all, and nowadays everybody has a cell phone. I wouldn't be surprised if they came up with a shoe phone. I like the character of 99. I like that a lot of the time she is the brains of the operation and the one that comes up with most of the good ideas. Max likes to take credit for her ideas though. He will always tell her no and then say the exact same thing she just said. I love the theme song to Get Smart. When we watch, we are always singing along to it even though it doesn't have any words. Even when we are not watching it, it is always running through my head. I guess that is because we have been watching Get Smart so much lately. I never would have decided to watch old Get Smart episodes on my own but I am enjoying it. And that's our view. What old TV show do you miss? When my brother was little he thought baseball innings were called endings or happy endings. Sometimes, he said "How many endings are there in a baseball game?" and sometimes he said "How many happy endings are there in a baseball game?" When Aurella was 2 we went to a baseball game and a player named Coby gave her a ball. She thought he was her boyfriend and wanted to know if he could come live with us. Another day, she was talking about him, and she smiled and said " my friend from the baseball game is cute." Spoiler alert: If you have not seen Monsters University and you intend to, do not continue reading this post. Me - Monsters University, opposite of wow! Monster's University was a horrible movie. I hated it so much. It was not nearly as good as Monsters, Inc. I didn't like the plot of the movie. The whole movie is about Sully and Mike at Monsters University, but in the end it turns out they started in the mail room at Monsters Inc. and worked their way up. Their jobs at Monsters, Inc. had nothing to do with college. They didn't even finish college. I felt like I was wasting my time watching the whole movie. I didn't like the characters in the movie either except the Oozma Kampas. Boo wasn't even in it one bit. If Boo was in it for even one second, I would have liked the movie tons better. Boo is a very important part of my life. I thought that they could have had it where Sully and Mike were telling the story to Boo. She could have been in it for a minute at the beginning and/or at least a minute at the end. They could have said something like "So you see Boo that's how we got to be scarers". They should have made a sequel instead of a prequel. Then, they would have had no choose but to put Boo in. At the end of Monsters University when Boo hadn't been in at all, I thought that after the credits they could have Boo pop out and say "Boo!" They didn't even do that which made the movie even worse. So even if you love the movie Monsters Inc., I wouldn't suggest seeing Monsters University. Mom - In our family, the movie Monsters, Inc is very near and dear to our heart. Monsters University not so much. The character of Boo, in particular, is greatly loved in our house. Boo reminded us so much of Melia when Melia was young. In fact, Melia used to have a Boo doll that was very much a major part of our family for many years. One of the things I liked the least about the movie was that there was no Boo in it. I realize that the movie took place before Boo was born, but I figured they would still find a way to put Boo in the movie in some way. Pixar does stuff like that all the time. A kid could have had a Boo doll like Boo had a Nemo toy in Monsters, Inc. The whole story could have been a flashback that Sully and Mike were telling to Boo. They definitely could have found a way to put Boo in the movie at least in a cameo. Aside from the fact, that Boo wasn't in the movie I didn't really like the movie anyway. I didn't like the characters. Even the characters of Sully and Mike weren't all that likeable. Mike was kind of a loser and Sully was conceited and lazy. I also didn't like the plot of the movie. They make it seem like you are going to see the story of how Mike and Sully ended up at Monsters, Inc. but it turns out their going to Monsters University had nothing to do with their jobs at Monsters, Inc. They didn't even finish college. They ended up working their way up from the mail room. While it is not a bad message to teach kids that with hard work you can move up in the world, even with hard work it is not necessarily so easy to move up this days as it once may have been. Also, is it really a good idea to teach kids that college doesn't really matter? I feel like I wasted my time watching this movie. I would rather watch the likeable Sully and Mike from Monsters, Inc. then the unlikeable Sully and Mike from this movie. I also didn't need to waste my time watching a whole movie about how they came to work at Monsters, Inc. when most of the movie had nothing to do with that anyway. The best part about the whole experience was the great new incredibly comfortable reclining seats they just put in at our movie theater. Sitting in those seats was definitely worth a few hours of my time. Monsters University was not. And that's our view. What movie did you look forward to and then find really disappointing? Uno Chicago Grill: Kids can make their own pizza. Each kid gets an apron to put on and to keep. The pizza dough is already made, but they are given sauce and toppings consisting of cheese and/or pepperoni, and they can put on as much or as little of each as they want in whatever way they want. This chain mostly has locations in the northeast and parts of the midwest. However, you can also find one or two locations in the following states: California, Colorado, New Mexico, Texas, Florida and South Carolina. Rain Forest Cafe: The whole restaurant recreates a rainforest with simulated plants and animatronic animals. There are, however, a limited number of locations. The most can be found in Florida, Cailfornia, Texas and Illinois, but there are a few in other places. Peanut Butter and Co.: If you are in the New York City area and your kids are picky eaters and only want to eat peanut butter and jelly, this is the place for them. You can also buy their products on-line or in many supermarkets. Johnny Rockets: This place looks like an old fashioned hamburger joint. They even have jukeboxes where you can still play a song for a nickel. They also offer deals where you can buy discounted movie tickets with your meal. There are Johnny Rockets in many locations throughout much of the country. Me- Today I am recommending Full House Behind Scenes. I learned a lot about the show and people in the show by reading this book. I would highly recommend it for any big Full House fan like me. Mom - Today I am recommending The Truth About Us by Darlene Flannigan. This book is about three former roommates from college with a secret that one of them suddenly wants to confess, - a secret which if revealed would have serious effect on all of their current lives. This book was a definite page turner. It was not at all predictable. It kept me guessing until the very end about how things were going to turn out. I like that in a book. Me -The change of TV seasons, wow! I am sorry that The New Normal ended. It was a really good show. At least it ended in a nice way. Goldie wasn't going to get remarried to her ex-husband. Brian and David got married and had their baby. Rocky had her baby. I can't wait for Nashville to come back. I want to see what happens with Raina and Deacon's car accident. I want to see if they stay together. I want to see what happens with Raina's daughters. I am so mad that Zendaya didn't win Dancing With the Stars, but I still can't wait to see who will be on it next season. I am so excited for Raising Hope's next season. It seems like it has been over for so long because it finished way back in March. I am really excited for next season of Glee because I really feel like Rachel and Finn are going to back together soon. They are like the cutest couple on TV. I can't wait for The Big Bang Theory to come back. I hope Fashion Star comes back because I really like that show. I guess Duets is over because it didn't even come back this season. I am so sad that Smash is over. At least, it ended really happy though and Karen was with Jimmy. Tom and Julia were friends again. Ivy and Derek were happily together and having a baby. Ivy and Karen were friends. Both shows had won awards. I am glad that Ben and Kate ended because it stunk. I enjoyed this season, but I can't wait for the next one. Mom - I do not really watch many TV series in the summertime so for me the TV season still ends in the spring. This past season I started watching Nashville, Ben and Kate, and The New Normal. I really like Nashville, and I am glad to see it got renewed. I can't wait to see what is going to happen. I really liked The New Normal too. It was too bad it got cancelled. However, the last episode was the perfect ending to the show, and I don't know where they would have gone with the storyline from there anyway. Ben and Kate started out promising, but went rapidly downhill from there. Almost all of the characters in it were annoying. It was sad to see that Smash got cancelled when it was finally starting to get better. I never thought that was a show that would really catch on with viewers in the middle of the country who have never been to a Broadway show anyway. I liked that they were at least able to wrap things up in a satisfactory manner in the last episode. I was sorry to see CSI: New York go. It has gotten so much better since Sela Ward came aboard. She makes any show she is a part of better. The show wrapped up nicely though with Mac's engagement. I look foward to more CSI and Law and Order: SVU next year as well as more Big Bang Theory which is as funny as ever. I look forward to more Dancing With the Stars depending as always on who the contestants are. I wonder if Fashion Star will be back. I wonder what new shows they will come up with for the fall. I am not really looking for new shows to watch though. I am probably one of the only people if not the only person who is at least at little happy when the shows I watch get cancelled and is not really excited about discovering new shows to watch. I would like to watch less TV instead of more TV and not because I am a snob who thinks TV is beneath me or anything like that. It is because the less TV I have to watch the more time I have to do other things like catch up on the DVDs and Blu-Rays that we are are always accumulating in our house. And that's our view. What show are you sorry to see cancelled and why?